Maak asseblief seker dat u e-pos korrek ingesit word in die veld hieronder, e-pos word slegs by geldige e-posadresse afgelewer. 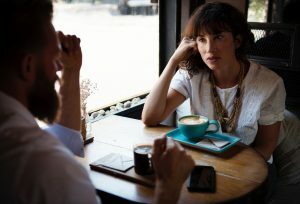 You may have been subjected to the compulsive talker in your workplace from whom you flee at the mere sound of his or her footsteps, or you may have had the misfortune of having had a guest at your dinner table who monopolizes the conversation and is oblivious to conversation etiquette, leaving you frustrated and embarrassed. You may wonder why some people talk so much? They talk to fill empty spaces, to relieve anxiety or to avoid emotions or unpleasant or threatening topics. People with poor social skills will cut you off mid-sentence to relate a personal experience or suffering which is better or worse than your experience, or say something totally unrelated to the topic. Then there is the narcissist who finds it rewarding to talk solely about himself, particularly if he has an audience at his mercy. In the office environment compulsive talkers are not only annoying but they also interfere with productivity and often monopolise meetings with unimportant or irrelevant issues. The difficulty is how to curb their behaviour without being impolite, offensive or even jeopardising necessary communication. Since talkers show little awareness with regard to the space, time and privacy of co-workers, it may become necessary to tell them bluntly that they are causing a problem and not feel badly about it. You may find that physical cues like avoiding eye contact, turning your chair away from the speaker, glancing at your watch, or putting on your head-phones have no effect on them. It is time to set clear verbal boundaries by telling the talkers you are busy and could they come back later. Tell people when you are free for a chat but have the chat take place in a space where colleagues will not be disturbed. Another way of dealing with talkers is to actually actively listen to what they have to say but to cut short the conversation by summarising what they have said, “Let me interrupt, what you have said so far is…” Take control and say, “Can we meet and talk about that at some other time? I am busy right now.” You can ask what the focal point is. In a meeting redirect the conversation to invite others to join in or cut the talkers short and ask what the focal point is. Thank them for their thoughts and go on to the next topic. If all else fails, you may have to bring this behaviour to the attention of management and suggest that someone has a word with the talker or suggest that silent periods be introduced during which work can take place without interruption. If you are a talker, be aware that your lack of conversational skills can cause offense. It sends a message that you are not willing to listen to what someone else has to say, that other people are unimportant, that you are just off-loading verbal garbage and that you have little respect for other people’s time. Talk about other things beside yourself, your achievements or gossip. In the office environment respect people’s space and time and speak only about work-related topics, or socialise in designated areas. Otherwise, unless you talk to entertain, wish to share, have an idea, or want to make people happy, you will do well to remain silent. You’ve made a (big) mistake at work. Now what? What are good work ethics?